Planning to study in Canada? Talk to us and stay connected. We’re full of ideas and inspiration to help you make informed decisions that will shape your future. Read the latest study in Canada news and watch our EduCanada videos. Follow us on social media and share your experiences. Remember to use the hashtag #EduCanada and #IntlEd. Connect with us on Facebook. Share your study in Canada hopes and experiences with us! View our photo gallery of international students and researchers studying in Canada. Get real insights from international students who have studied and lived in Canada. 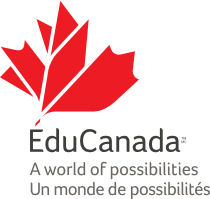 Stay current with the latest EduCanada news on studying in Canada. Stay up to date with Scholarship launches and related news. We tweet too! Follow us to find out the latest about studying in Canada—or to connect with others pursuing their study in Canada dream.